RuleML+RR 2019 will take place in Bolzano, Italy, on the 16-19 September 2019 and will be part of the BRAIN 2019, the Bolzano Rules and Artificial Intelligence Summit. RuleML+RR 2019, the 3rd International Joint Conference on Rules and Reasoning, is the leading event in the field of rule-based reasoning. Stemming from the synergy between the well-known RuleML and RR events, one of the main goals of this conference is to build bridges between academia and industry. RuleML+RR 2019 aims to bring together rigorous researchers and inventive practitioners, interested in the foundations and applications of rules and reasoning in academia, industry, engineering, business, finance, healthcare and other application areas. It will provide a forum for stimulating cooperation and cross-fertilization between the many different communities focused on the research, development and applications of rule-based systems. RuleML+RR 2019 will take place in Bolzano, Italy, on the 16-19 September 2019 and will be part of the BRAIN 2019, the Bolzano Rules and Artificial Intelligence Summit. 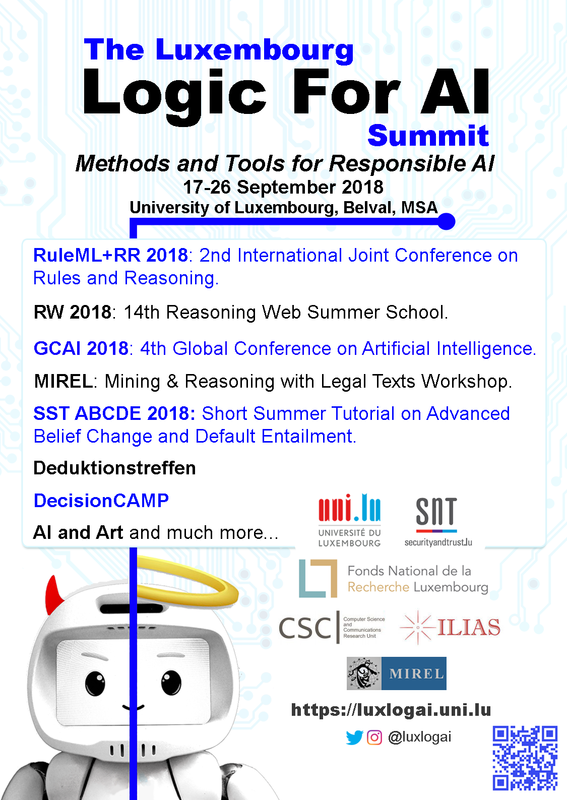 With its special focus theme on "Beneficial AI", BRAIN 2019 brings together the 3rd International Joint Conference on Rules and Reasoning (RuleML+RR 2019), DecisionCAMP 2019, the Reasoning Web Summer School (RW 2019) and The 5th Global Conference on Artificial Intelligence (GCAI 2019). For more information, see http://2019.ruleml-rr.org. 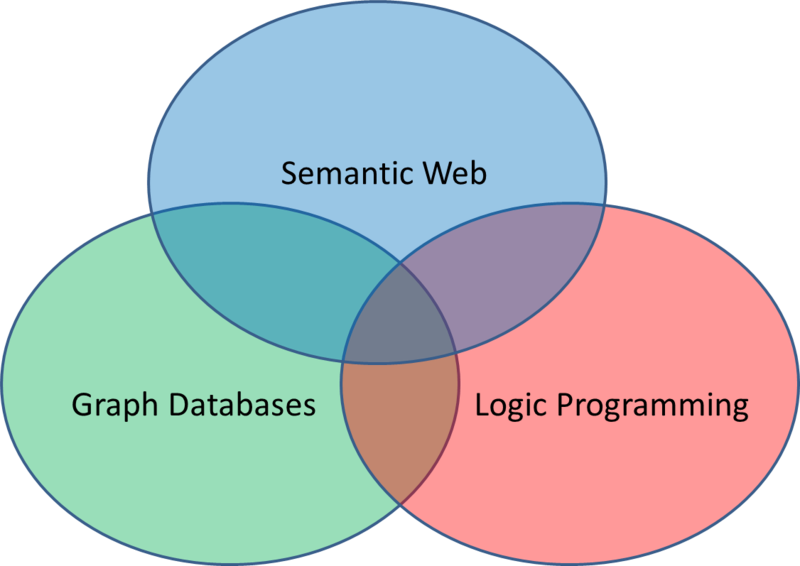 Combinations of the Semantic Web, Graph Databases, and Logic Programming are explored. Data are complemented by Knowledge (Ontologies and Rules). Graphs and Relations are integrated. The ensuing synergies cross-fertilize tools and techniques and contribute to eXplainable Artificial Intelligence and IT at large. As an example, representations of Cypher's Labeled Property Graphs in RDF and PSOA RuleML are discussed. The 2nd International Joint Conference on Rules and Reasoning RuleML+RR 2018 was held on September 18-21, 2018, at campus Belval of the University of Luxembourg. 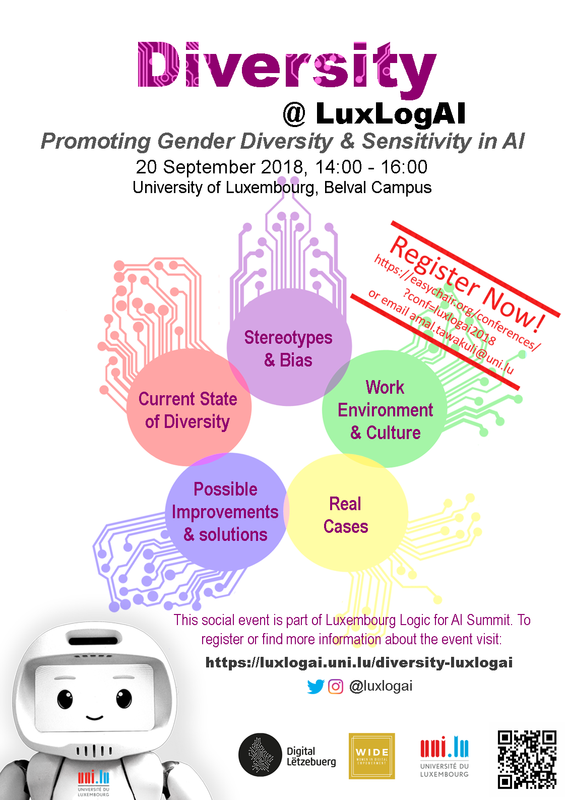 The conference was organised as one of several collocated events of the Luxembourg Logic for AI Summit 2018, which was substantially supported by the Luxembourg National Research Fund (FNR, RESCOM/18/12426287). a workshop on self-organising systems and a tutorial on advanced belief change and default entailment. LuxLogAI 2018 featured a stellar line-up of eleven internationally recognized invited speakers, complemented by regular presentations of research papers. RuleML+ RR 2018 provided a rich programme, with five keynote talks, two tutorials, a regular program together with several sub-events: an industry track, the 12th International Rule Challenge 2018 , a doctoral consortium and a poster session. Hannah Bast (University of Freiburg) presenting "Efficient and Convenient Search on Very Large Knowledge Bases"
Georg Gottlob (University of Oxford) presenting "Vadalog: A Language and System for Knowledge Graphs"
Guido Governatori (Data61/CSIRO) presenting "Modal Rules: Extending Defeasible Logic with Modal Operators"
Philipp Slusallek (Saarland University/DFKI) presenting "Understanding the World with AI: Training and Validating Autonomous Systems Using Synthetic Data"
Gottlob, de Paiva and Slusallek were each a joint GCAI keynote. The Doctoral Consortium (DC) consisted of four papers, one of which, the winner of the DC best paper award, was presented as a full research paper and is contained in the RuleML+RR 2018 proceedings. The six presentations and demos of the Rule Challenge addressed diverse areas, like air traffic control regulations, the British Succession to the Crown Act 2013', rule mining and ontologies. The industry track consisted of four invited presentations on the topic of rule languages and AI in industry. It was followed by the highly successful public round table discussion event AI: Truth or Dare at KPMG Luxembourg devoted to Responsible Artificial Intelligence and the European future. This public round table was perhaps one of the main highlights of the LuxLogAI conference. The panel consisted of nine experts in AI from politics, industry and academia, like for instance Viviane Reding, former vice president of the European Union. The event had repercussion in the media, see https://today.rtl.lu/media/vox-pops/1243397.html. The poster session of RuleML+RR was combined with that of the Deduktionstreffen, and consisted of seven poster presentations. The LuxLogAI conference dinner took place on a boat on the Moselle river during a cruise in the evening. Artist Egberdien van der Torre gave an art performance, and Yolanda Spinola-Elias (University of Seville) held a dinner speech entitled “An AI+A serendipity?”. She explained that Artificial Intelligence and Art confluences and conjunctions may not rely only on a serendipity process, but on a deeply intentional Art, Science, Technology and Society creative research system. Meta, multi and/or interdisciplinary creative processes were some of the issues that “AI and Art” covered during LuxLogAI 2018 in order to provide a wide perspective of AI impact in Art and vice versa. LuxLogAI attracted a total of 224 registered participants. Of these 224 participants, approx. 100 attended RuleML+RR and GCAI. The LuxLogAI/GCAI best student paper award was given to Ruin Silva, Francisco S. Melo and Manuela Veloso, for their paper “What if the world were different? Gradient-based exploration for new optimal policies”. The winners of the RuleML+RR best paper award were Stathis Delivorias, Michel Leclere, Marie-Laure Mugnier and Federico Ulliana, for their paper entitled “On the k-Boundedness for Existential Rules". The winners of the RuleML+RR Best rule challenge demo were Theodoros Mitsikas, Sofia Almpani, Petros Stefaneas, Panayiotis Frangos and Iakovos Ouranos for their presentation entitled “Formalizing Air Traffic Control Regulations in PSOA RuleML”. The winner of the RuleML+RR best poster award was Lukas Grätz, for his contribution entitled “Concepts as Modalities in Description Logics”. A selection of the papers with the highest reviewing scores were invited to submit an extended version of their papers to the Special issue on “Logic Rules and Reasoning” of the Journal of Theory and Practice of Logic Programming (TPLP). A special thanks goes to all sponsors of RuleML+RR 2018 and LuxLogAI 2018: Binarypark; the Computer Science and Communications (CSC) Research Unit at the University of Luxembourg; the Department of Mathematics and Computer Science at the University of Calabria; the Interdisciplinary Centre for Security, Reliability and Trust (SnT) and the Interdisciplinary Lab for Intelligent and Adaptive Systems (ILIAS) at the University of Luxembourg; LogicalContracts; the Luxembourg National Research Fund (FNR); oXygen; and Springer. A special thanks also goes to the publisher, Springer, for their cooperation in editing and publishing the conference proceedings, and to the CEUR voluntary organisation and EasyChair Publications for providing the facility to publish the proceedings of the conference sub-events. The 3nd Int'l Joint Conference on Rules and Reasoning is planned as part of the second edition of the Logic for AI Summit. It will take place in Bolzano in Italy in September 2019. The PSOA RuleML language and its PSOATransRun engine provide cross-paradigm deductive querying. Knowledge representation in PSOA RuleML is explored with a progression of data and rules built from relations (tables), objects (graphs), as well as their systematic integration and extension. All kinds of data from this PSOA systematics are visualized by generalized (hyper)graphs in an extended Grailog. Building on relational Herbrand models, object-centered and object-relational Herbrand models are presented as a novel model-theoretic semantics for such data and rules. Comprehensive PSOATransRun query & answer pairs for the same PSOA knowledge bases exemplify the proof-theoretic semantics. General notions are illustrated by varieties of transitive closure as high-level knowledge about blockchains like Gridcoin and Chia Network. Modern knowledge bases have matured to the extent of being capable of complex reasoning at scale. Unfortunately, wide deployment of this technology is still hindered by the fact that specifying the requisite knowledge requires skills that most domain experts do not have, and skilled knowledge engineers are in short supply. A way around this problem could be to acquire knowledge from text. The current knowledge acquisition technologies for information extraction are not up to the task because logic reasoning systems are extremely sensitive to errors in the acquired knowledge, and existing techniques lack the required accuracy by too large of a margin. Because of the enormous complexity of the problem, controlled natural languages (CNLs) were proposed in the past, but even they lack high enough accuracy. Instead of tackling the general problem of text understanding, our interest is in a related, but different, area of knowledge authoring—a technology designed to enable domain experts to manually create formalized knowledge using CNL. Our KALM system approach adopts and formalizes the FrameNet methodology for representing the meaning, enables incrementally-learnable and explainable semantic parsing, and harnesses rich knowledge graphs like BabelNet in the quest to obtain unique, disambiguated meaning of CNL sentences. Our experiments show that this approach is 95.6% accurate in standardizing the semantic relations extracted from CNL sentences—far superior to alternative systems. For more information, see KALM Code and KALM short presentation. - MIREL (MIning and REasoning with Legal texts) Workshop: 17 September 2018. - 4th Global Conference on Artificial Intelligence (GCAI 2018): 17-19 September 2018. - DecisionCAMP (Business Rules and Decision Management Technology): 17-19 September 2018. - AI and ART: 17-19 September 2018. - 2nd International Joint Conference on Rules and Reasoning (RuleML+RR 2018): 18-21 September 2018. - Self Organizing Systems (SOS): 19 September 2018. - Diversity@LuxLogAI: 20 September 2018. - Annual meeting of the Deduction Systems group of GI e.V. (Deduktionstreffen 2018): 21 September 2018. - Reasoning Web Summer School (RW 2018): 22-26 September 2018. 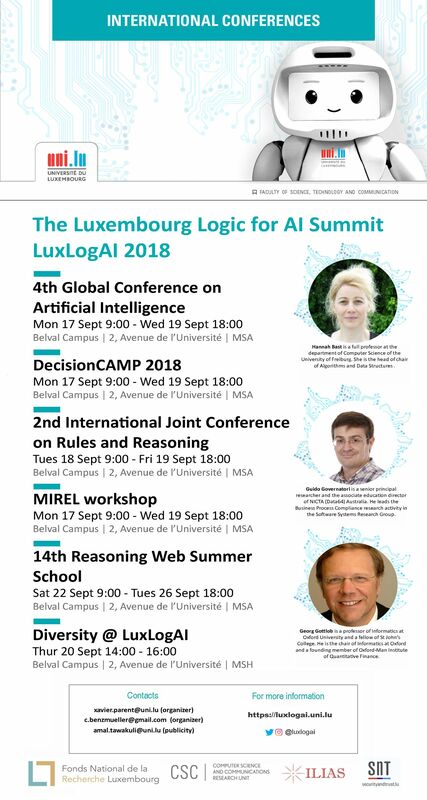 The Luxembourg Logic for AI Summit (LuxLogAI 2018) brings together the 2nd International Joint Conference on Rule and Reasoning (RuleML+RR 2018), the Reasoning Web Summer School (RW 2018), the Global Conference on Artificial Intelligence (GCAI 2018), DecisionCAMP 2018 and the annual meeting of the Deduction Systems group (Deduktionstreffen 2018) of the German Gesellschaft für Informatik (GI). RuleML+RR 2018 calls for additional short poster papers related to theoretical advances, novel technologies, and innovative applications concerning knowledge representation and reasoning with rules. A Best Poster Award will be given to the best poster presentation. The annual meeting Deduktionstreffen (Deduktionstreffen 2018) is the prime activity of the Interest Group for Deduction Systems (FGDedSys) of the German Informatics Society (Gesellschaft für Informatik). It is a meeting with a familiar, friendly atmosphere, where everyone (not only the German community) interested in deduction can report on their work in an informal setting. The Deduktionstreffen will also host the annual general meeting of the members of FGDedSys. Contributions on all theoretical, experimental and application aspects of deduction are welcome.